In our post "How to Create an Internet Presence to Help Kidney Donors Find You" (this blog) we recommend using Facebook only to publicize your Kidney website but to use a blog (like one hosted by Blogger.com or Wordpress.com) as your more permanent and flexible base of operations or landing zone for the information that you want interested readers to see. 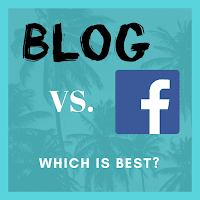 "Why Blogging is So Much Better than Facebook"
Larry Bodine, a long-time friend and marketing guru, holds similar views. He writes in "Why Blogging is So Much Better than Facebook" about the reasons to avoid Facebook pages and to prefer a blog for your information. 1. Facebook truncates long-form content. "Facebook truncates content at 400 characters with a "See more" link. Updates with 40 to 80 characters or less (8 to 16 words) are considered the ideal length for Facebook. On a blog, the sky is the limit in length. With a blog, you own the site and can change a post's length, its design, the marketing, and anything else you could want to change. With posting to Facebook, you're limited in all of those things." 2. Facebook posts are not sent to all of your followers. "You may have 5,000 followers, but when you post an update, only 2% of your fans will see it. This is because Facebook wants you to pay to "boost" a post. On Facebook, your carefully-prepared article will appear to a tiny segment of your fans and then be overwhelmed by the social torrent. However, if you have 5,000 followers of your blog, all of them will be able to see it." 3. Blog posts last much longer. "A blog post will be an evergreen resource for years, while a Facebook post is essentially seen once, and is then lost in the feed. A Facebook post has a steep drop-off in readers, is virtually valueless after a week, and might as well not exist after a month. In contrast, a blog post will generate readers on the first day it's online and will continue to turn up in Google searches year after year." 4. Blogs are more stable. "Facebook is known to update its algorithm, change its layout or even ban people at a moment's notice. Facebook is constantly changing its platform and policies. Your blog is under your total control, and no changes will happen unless you make them." 5. Google loves blogs. "Here are some statistics that prove the value of a blog for SEO. Websites with blogs have 434% more indexed pages than websites without." Thanks Larry for sharing your insights and for allowing us to quote your material and use your graphic.